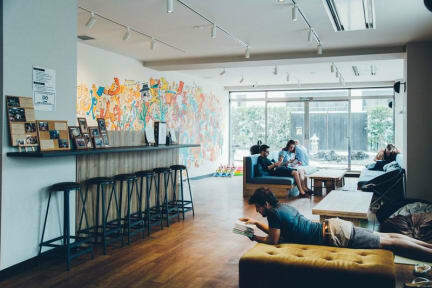 Emblem Hostel is a brand-new hostel designed for international travelers who seek fun, comfortable and unique accommodation options. Our hostel offers more than a simple stay - cultural and intellectual experiences through interactions with locals, other guests and our staff. Our hostel is located in the north-east region of Tokyo where international tourists have yet cultivated to explore. 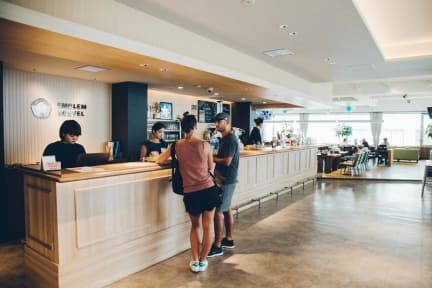 Within less than 20 minutes' away from the most popular destinations such as Asakusa, Ueno and Skytree, the property is surrounded by convenient retail and dining options such as large shopping malls, grocery stores and charming local pubs. - Movie night with snacks! -Many kinds of Hamburgers for lunch! On the top of the total amount, we collect 1,000 yen for key deposit. It is refundable when checking out with returning room key and locker key. Complimentary for 1 child under 3 years in private rooms. 4 to 11 years can stay occupying a bed only in pricate rooms. O hostel é espetacular. Tudo novo, limpo e fantastico. Recomendo até para as pessoas que nao gostam de hostel. É um hotel 5 estrelas. I stayed there for just one night, but it was great. One minute from the station only, and everything was fine! Espetacular! Parece hotel. A localização é um pouco longe do centro e das linhas do JRPass, mas nada que não seja compensado, e muito, pela estrutura do hostel. Great hostel with polite and wonderful staff. Clean facilities and free breakfast. Only downside is the location which is quite a distance to get to from central Tokyo but overall, amazing amazing hostel! Great place, far from the center of Tokyo but in a cool area and very close to the subway.